A friend and colleague from FrontRowEdit, recently posted about the most gorgeous limited edition, Audemars Puget, Frosted Gold Royal Oak. It was love at first sight and that love has evolved into an outright obsession. The 37mm timepiece features a remarkable Frosted gold finish and a mirrored dial. The watch was conceived by Italian jewelry designer Carolina Bucci and limited to just 300. The retail price is $52,000. The designer explains that the focal point of the new design is the mirrored dial, which has been crafted with painstaking precision. "The mirror is always interacting with its environment, ever-changing according to what clothes you're wearing, the décor of the room, the lighting, the time of day, the weather," she says. "I know women with a great eye for keynote accessories who are going to love this." Caroline must have been reading out mind. The price tag might be a little bit much for a weekend shopping outing but while snooping around we felt satisfied settling for Caroline Bucci's other jewelry designs. We love this heart-shape ring ($3480) that utilizes the same Florentine-technique hammered gold finish as the Royal Oak. These hoop earrings are equally as beautiful and just $720. If you're still yearning for some arm adornments, go for this coil 'Caro' bracelet ($550). If you're really looking for a great deal on something Caroline Cucci we suggest you click to TheRealReal,. We found the Italian jewelry designer's inventory heavily discounted. This version of the Caro bracelet can be found for as little as $144, chain hoop earrings are just $925, gold bangles with charms are $500 and a twisted colored rope bangle is $145. 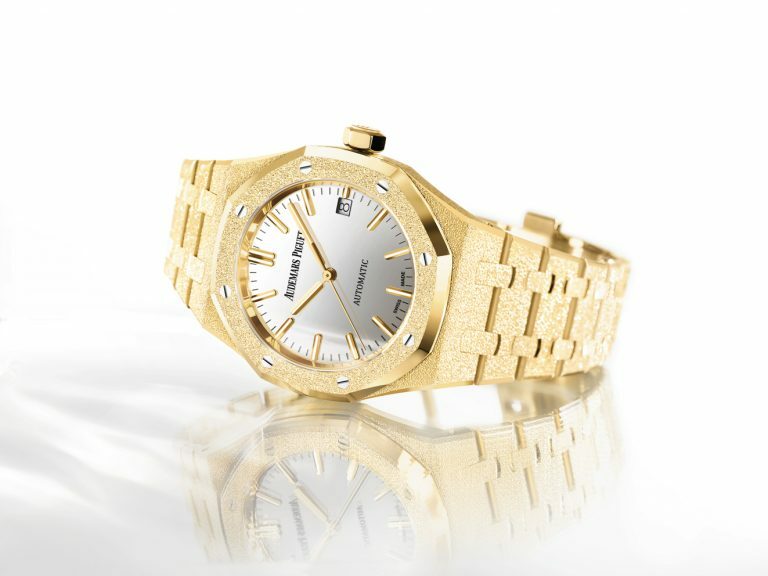 The Caro bracelet is an okay temporary diversion for our Royal Oak obsession but it's not a cure. After all, the combination of a mirrored dial and a watch could make our iPhone obsolete, right?